At 6:00 the sky was already blue and after leaving a couple of bags at reception we checked out and headed straight for Vihren hut. There were already several cars parked in front of it, and more came as we got changed and started the walk up Vihren peak. The sun came out over the high mountains as we gained altitude through a well trodden path, but nothing as touristy as the seven lake trek in park Rila. 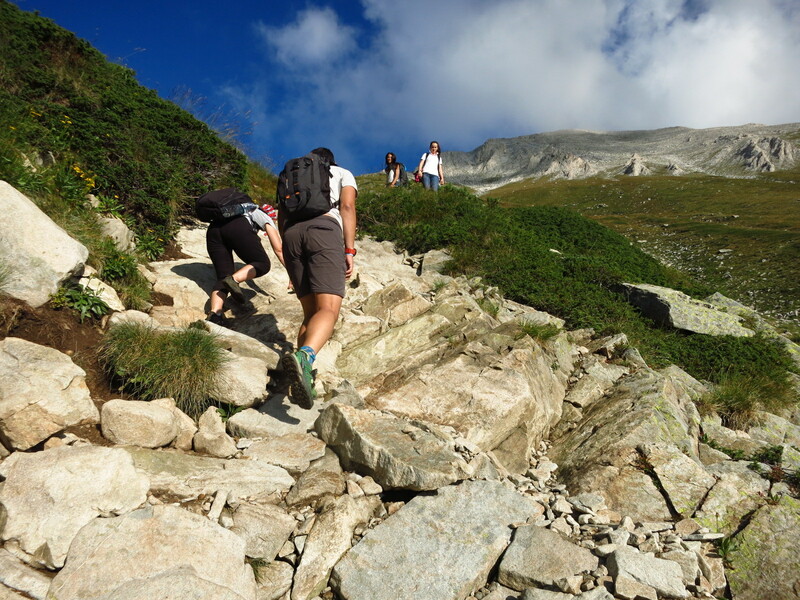 Even though this was a relatively easy peak – the way was clearly indicated in red marks and there was not need to climb at all, just walk to the summit – the way the path gained altitude was unforgiving. It went straight up right after setting off from the hut, and it kept going that way for most of the 900m ascent. 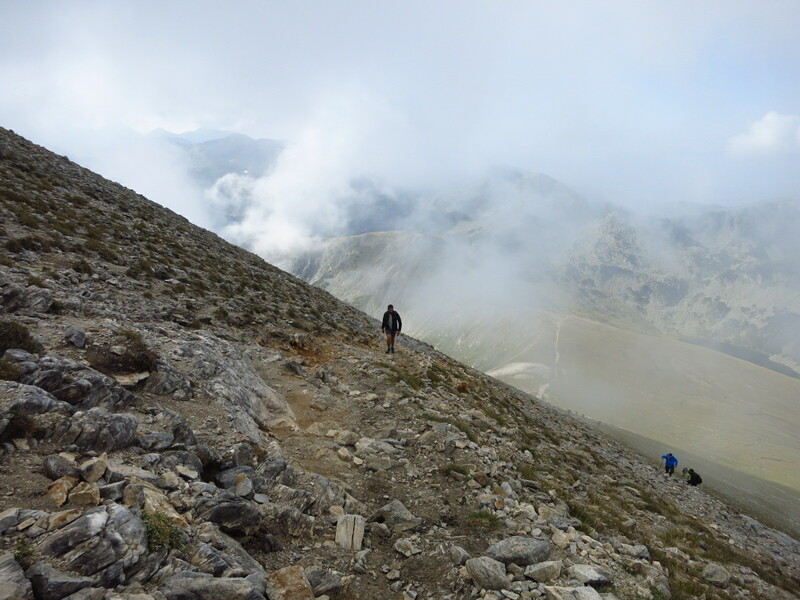 We reached the col before the peak in good time, having passed several groups of people who had started earlier but were making slower progress, and from there we saw that the peak was covered in clouds. Fortunately, they were not think enough to be a visibility problem, and we could still follow the trail to the top. 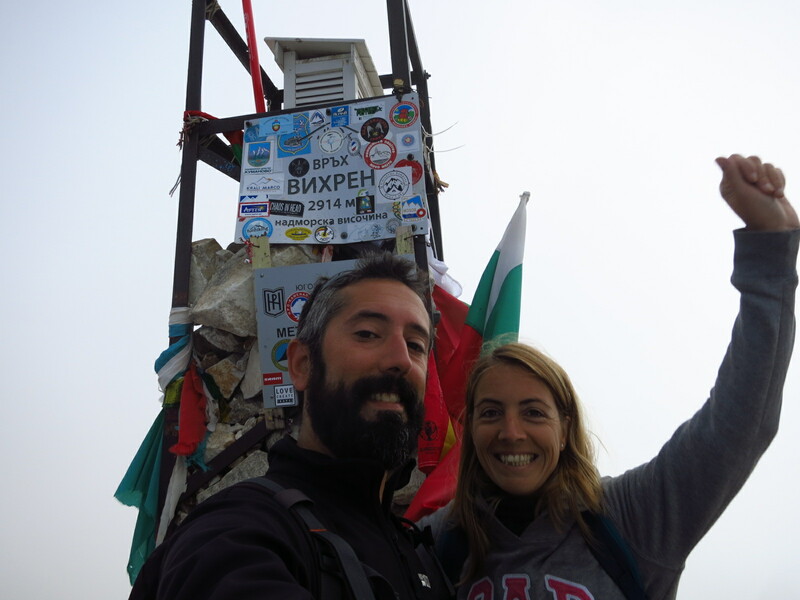 We reached it in two hours sharp, an hour less than the sign in the hut said. 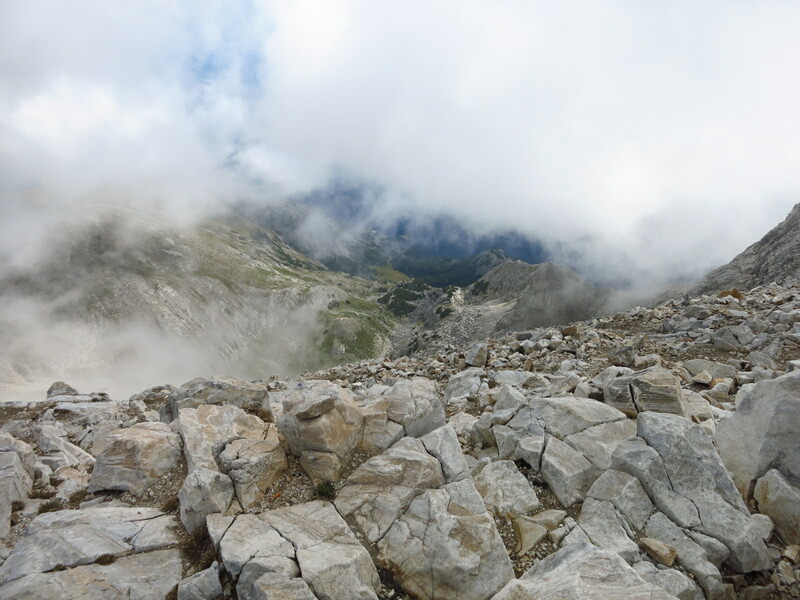 The temperature was a lot lower there, and it was quite windy, so we just took a few pictures, had a snack and glimpsed at the views through the occasional gap in the clouds. The way down was even faster, and we only stopped two or three times to takes clothes off as the temperature rose again during the descent into the valley. We were surprised by the high number of people that kept coming up the opposite way – this was clearly a popular peak, but I have seldom seen people starting a climb so late. Not only was it way too hot on the way up at this time, but there were clouds gathering over the surrounding mountains, and the weather can change very quickly in the afternoon in the mountains. We had started walking at 8:30, and there were very few people ahead of us. 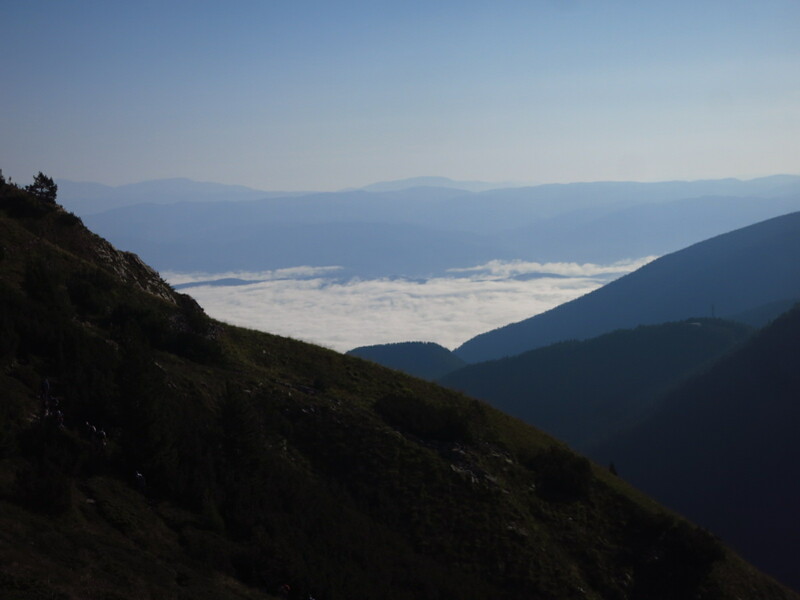 If you start walking at that time in the Pyrenees, you are likely to be among the last. When we reached the hut I checked my watch to see what time we had made – four hours total, up and down. It was a great time, and I reached into my backpack to get the GoPro out and take a picture of the time on the watch with the hut as background. I rummaged about and was not able to find it. I emptied the whole backpack, turned all pockets inside out, and realised, to my horror, that the camera was not there. I remembered that I had taken the last picture on the col, right after coming down the rocky slope from the peak, and after we had only stopped once – the first time I put my neck warmer into the bag, the second time Nat took out some stuff to get some tissues. Either I had left the camera on a rock on the first occasion, or it had fallen out of the bag on the second. Most likely the latter. That had happened about 300m above the hut, so without thinking twice, I told Nat to wait for me and went running back up the mountain. I reached the spot a while later, covered in sweat and out of breath, hoping to find the camera lying on the ground, as it was a bit off the main path, but it was not there. The other place where we had stopped was much higher, almost two thirds of the way up to the peak, and that time it had been right on the path, so the chances of finding it were slim… However, I did not want to go back without trying, not because of the camera itself, I could always buy another one, but because the SD card in it contained many of the pictures and videos of our holiday so far. After catching my breath for a moment, I went on running up until I reached the other spot, but the camera was not there either. Defeated, I started to walk down the mountain, still fast, because Nat thought that I had only gone up the lowest spot and I guessed she might be starting to worry that I was taking so long. I reached the hut exhausted, having passed people up to three times – on the normal way down, then running up for the camera, then running down again – I don’t know what they might have thought I was doing. All in all, I had climbed 1600m, lost all the time advantage we had gained when we first came down to the hut and now we had to pack things up and ride all the way to Sofia. 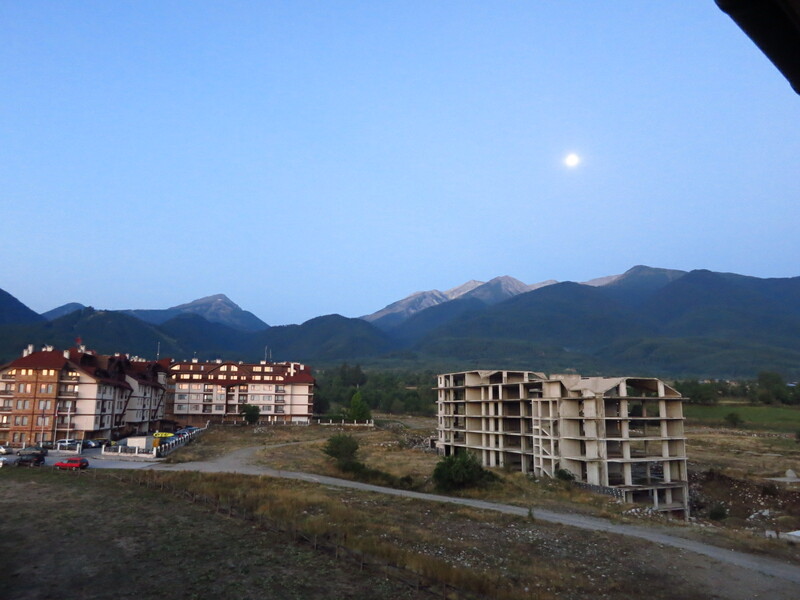 With our mood at an absolute minimum, we picked our stuff from the hotel and left Bansko. Nat was feeling very sad about the pictures, and I kept trying to make light of it and telling her not to worry, but between the stifling heat down at the Blagoevgrad valley, my state of exhaustion and the ride ahead of us, I snapped at her when we stopped at a petrol station. I felt miserable about it for the rest of the way into Sofia. With such a mood, our first impression of the city was not the best one, not helped by the fact that we entered through what I later learned was the ‘gypsy neighbourhood’, where we saw street after street of people carrying waste in donkey carts and cars half dismantled every two corners. 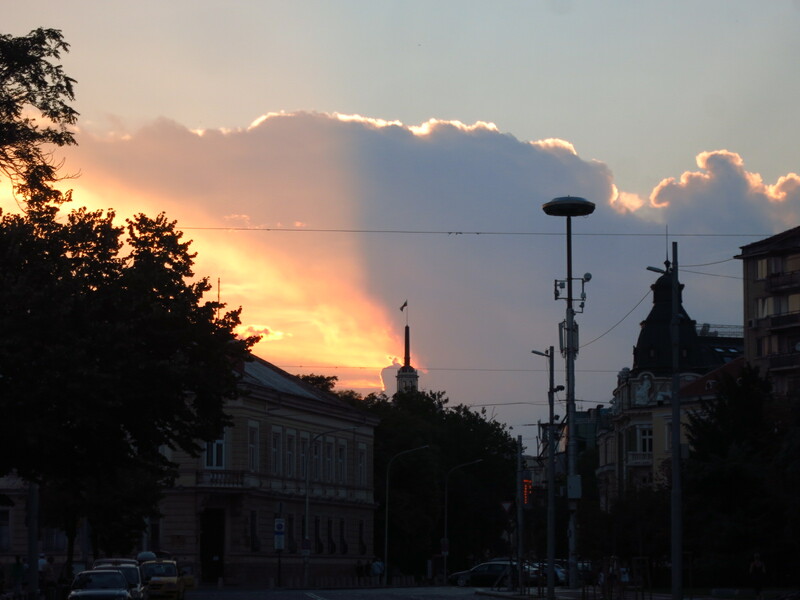 Things started to improve a bit by the time we reached, our hotel, saw the room, had a shower and went to see the famous Alexander Nevsky cathedral in the sunset. By the time we had found a nice grill restaurant, had a marvellous meal and two gin and tonics for dessert, we were finally smiling again. This entry was posted in Balkan Adventure 2016, Travel and tagged Bansko, Bulgaria, GoPro, Honda CRF 1000L, Pirin natural park, Sofia, Vihren hut, Vihren peak by Kilian. Bookmark the permalink.